AgriTheory - Is your equipment investment profitable? Since the useful life of the equipment is longer than one year and is often financed for a period of years, it’s a question that every producer or service provider should ask. There is a certain peace of mind knowing that your investment actually does pay. Consider the following: what you get out of the equipment in terms of net income (work value), what you get if you sell it (Fair Market Value (FMV)), and the opportunity cost of another investment such as a bank’s Certificate of Deposit, (C.D.). The example in the chart above shows a round hay baler that a dealer has listed for $30,000, assumed to be a good price, so it’s fair market value. The baler will decrease in value by 30% the first year and an additional 20% each year after, see the dark blue line. At the end of year 1, the baler has a value of $21,000. The yellow line is the annual value of the work the baler does. Put another way: it is what it would cost to have someone else do the work or the net earnings of renting the baler out. It starts as 1/6 of the investment. After five years the work value declines by 20% per year for increased repair costs. The orange line is the opportunity cost of investing that money, which is assumed to return a rate of 2.25% per year - currently available in a five-year C.D. Here it is an annually compounded rate. The green line is the cumulative figure of the work value of the baler, which in technical terms is the annually compounded value of the return on investment (ROI) yielded. 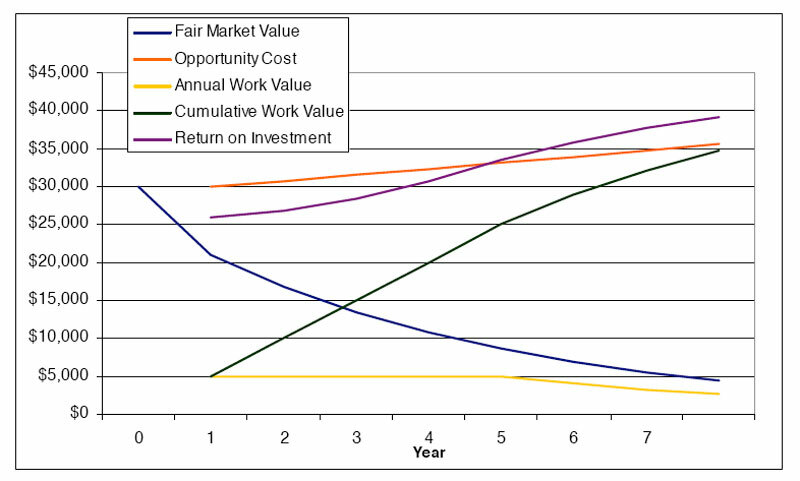 The purple line combines the market value of the baler (blue line) and the annual work value (yellow line) to show the total return on your investment. In the end, if you were to sell the baler, consider selling after five years as you would break even in year 5 and have a net return in subsequent years. The facts of any capital investment are more complicated than this example. Fully exploring them makes it more likely you won’t make a bad decision. In general the higher the percentage of asset (e.g. 1/6 of the baler in this example) that it returns to you, the sooner you will break even on that investment, which is money well spent. Originally published in Progressive Forage Magazine.